The recall affects 196,500 model year 2004 through 2007 Ford Freestar and Mercury Monterey minivans in the United States and another 33,500 outside the U.S.
Ford has announced it is recalling 230,000 model year 2004-2007 Ford Freestar and Mercury Monterey minivans due to a corrosion issue that can cause third-row seats to become lose. The recall involves 196,500 minivans in the United States and an additional 33,500 outside the U.S., primarily in Canada. Ford’s rust recall only affects Ford Freestar and Mercury Monterey vehicles sold or registered in 20 “salt belt” states, which are: Connecticut, Delaware, Illinois, Indiana, Iowa, Maine, Maryland, Massachusetts, Michigan, Minnesota, Missouri, New Hampshire, New Jersey, New York, Ohio, Pennsylvania, Rhode Island, Vermont, West Virginia, Wisconsin and the District of Columbia. The recall is the result of a 14-month investigation by the National Highway Traffic Safety Administration. Ford first became aware of the corrosion problem in August 2011 when a customer complained of difficulty latching the third row seat to its seating position. There have been 80 complaints reported, but no injuries, according to Ford. Ford will begin notifying owners of the recall later this month. Authorized dealers will install new third-row seat latch striker mounting brackets. Additionally, dealers will install overlay panels on the exterior of the wheel wells to stop the entry of water and other corrosive elements. In the meantime, Ford Freestar and Mercury Monterey drivers can contact Ford at 1-866-436-7332. Concerned owners can also contact the National Highway Traffic Safety Administration’s Vehicle Safety Hotline at 1-888-327-4236 or online at www.safercar.gov. 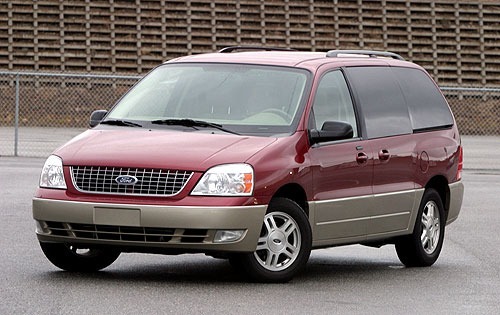 The Ford Windstar, the Freestar’s predecessor, was recalled last year due to front-subframe rust problem. The recall concerned 425,000 model year 1999-2003 Windstar minivans in the U.S. and another 175,000 in Canada. According to the recall notice, the rust defect could cause the vehicle’s rear axle to break. Ford also issued a massive rust-related recall in August 2011, involving 1.2 million Ford F-150, F-250 and Lincoln Blackwood trucks. The automaker issued the recall to replace straps that hold fuel tanks in place because they might be susceptible to corrosion and breakage. As a result, the fuel tank may fall to the ground, which may cause a fuel leak and/or a fire. The recall affected 1.1 million vehicles in the United States and approximately 100,000 in Canada. The Ford Freestar and its sister vehicle the Mercury Monterey were sold from 2004 through 2007. The Freestar and Monterey were heavily criticized throughout their three-year run due to transmission and brake problems, lack of refinement and poor interior quality. The Freestar’s successor, the Ford Flex, made its debut at the 2007 New York International Auto Show.